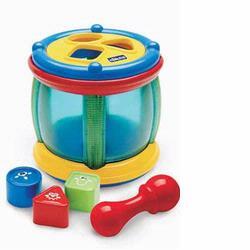 The Shape Sorter Drum is 2 toys in 1. One side of the toy is an electronic tambourine whose smiling face can be played with your baby's hands or with the included hammer. The tambourine also features amusing sound effects that will keep your baby smiling. The other side of the Shape Sorter Drum is a shape sorter. Your baby can improve coordination and logical associative skills by working to fit the three colored shapes into the appropriate slots. The Shape Sorter Drum also rolls, which encourages your baby to crawl or walk to follow the toy.